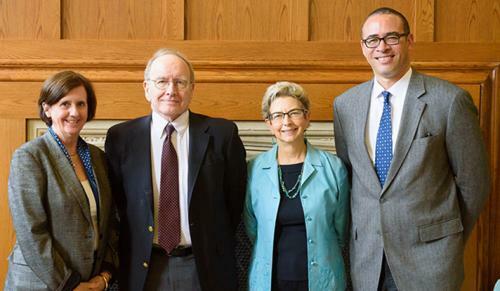 John Gaddis was one of two receipients of the Howard R. Lamar Awards for Service to Alumni on April 29 at a luncheon hosted by the Association of Yale Alumni (AYA). The awards, first presented in 2014, are named for Lamar, the 21st president of the university and Sterling Professor Emeritus of History, who was one of the inaugural recipients, along with professors Marie Borroff, Donald Kagan, and Vincent Scully Jr. Professors Laurie Santos and Paul Bracken received the awards in 2015. Presented by the AYA Board of Governors, the awards celebrate the contributions faculty make to alumni programs and honor those who have demonstrated exemplary leadership for alumni relations by the ways in which, through their scholarship and activities, they have rendered service to the Yale family worldwide. The New York Times has hailed you as the “Dean of the Cold War Historians.” You have been recognized by the Pulitzer Prize Committee, the National Endowment for the Humanities, and the President of the United States. But Yale alumni know you first and foremost as an engaging teacher and enthusiastic supporter of their activities around the world. Every year, scores of students apply for a seat in the “Grand Strategy” seminar, which you co-founded in 2000 and still co-teach. Bringing in world leaders and intellectuals, the seminar prepares Yale students to think globally and strategically about urgent problems. This mindset comes naturally to you, after decades closely scrutinizing the interplay of world events. Your biography of the American statesman George Kennan is the seminal work on this influential diplomat and political scientist, and you have explored the facets of Cold War containment and strategy throughout your career. As a teacher you are highly praised, having won Yale Phi Beta Kappa’s DeVane Medal for undergraduate teaching in 2003. You have been generous, too, in sharing your expertise with Yale alumni. Since your arrival at Yale in 1997, you have taken nine trips around the world with alumni groups, from the wilds of Alaska to the trans-Siberian railway. On more than 40 occasions, you have introduced alumni groups to the “Grand Strategy” curriculum you helped devise. You are an in-demand lecturer at reunion events and Yale Clubs across the country, and alumni everywhere appreciate how you have given back to Yale. You make them feel proud of their alma mater. For your teaching, leadership, and willingness to reach out to Yale alumni, the Association of Yale Alumni gratefully presents to you the Howard R. Lamar Faculty Award.